This piece first appeared on Medium. See Tamara’s complete bio and contact info below the post. People always ask me why I love Croatia so much. And as I’m starting in 2016 to stay here as much as in my “home” of California, I’m going to be trying to explain why . . . . This is where I catch the bus. Picturesque and then some. So is the half-mile walk along the “riva” (sea walk) there and back from the place I rent. Do you see how the bus is waiting there? That is because the very kind bus driver is aware of the humans in his surroundings and actually wants to help them. And when he looks in his rear view mirrors and sees you hurrying along the riva to catch the bus that comes every half hour on weekdays from 5:30 a.m to 11:30 p.m. (or 23;30, as we say in Europe), he waits for you. And the kind riders already inside are not upset by this. They want you to make it, too. And they know the same kindness and civility will be extended to them when they’re running late. Ten kuna (about $1.50) one-way, if you buy individual one-way tickets. If you buy a round-trip ticket at one of the kiosks everywhere that sell newspapers, cigarettes, candy and bus tickets (among just about everything else), you can get a round-trip for 16 kuna. You can also buy month-long passes for about 250 kuna. Students and seniors ride as much as they want and need . . . FOR FREE. 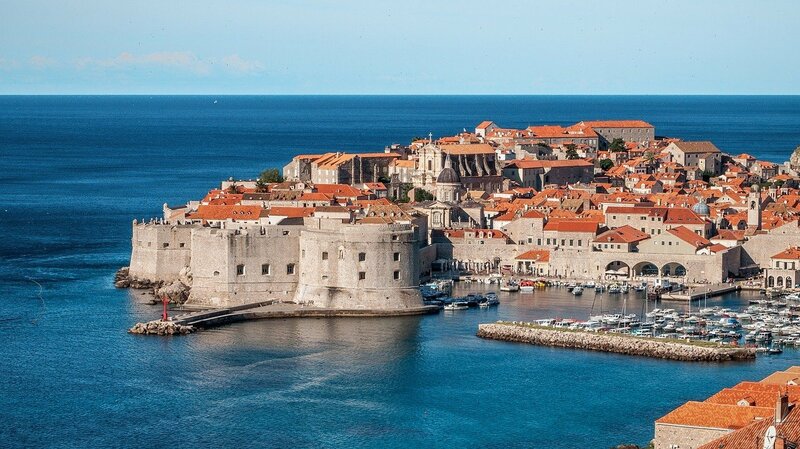 Croatia is a country about the size of West Virginia, has a total population of around four million people, and is shaped like a croissant. All of these things mean that buses are the most nimble, efficient and economical way to transport the populace. Not trains. That would be a waste of infrastructure. So, Croatia has its bus system nailed. This is not to say that it’s always some clockwork-running country like Germany or Switzerland where there are no timing issues, difficulties . . . adventures. But, by and large, a bus is going to do a good job of getting you a mile down the street, or from your little town to the big city, or from city to city to city. You see your neighbors on the bus. You see the same people on the bus many times. You see how kids from school act . . . the way thirteen-year-old boys still nudge each other when they see a beautiful woman get on the bus, or sit in her car that the boys can see through the bus window. You see people of every single age and type on buses in Croatia. You see the way people relate to each other. And you even get the chance to practice your Croatian with them. This does not seem to be the case in America. Where, admittedly, I never ride the bus these days. Where, in the suburban San Francisco Bay Area at least, mostly none of the things I’ve just enumerated here are happening on a regular basis. But in Croatia? Bus drivers are kind of badasses. 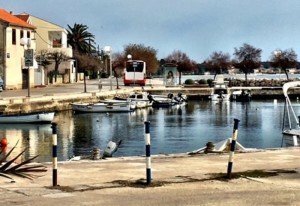 Most days, I see at least one or two people — young and old, male and female — who get on the bus in my “suburb” of Zadar and then stop as soon as they pay. To be able to stand next to the driver and talk to him as he drives. They don’t take a seat. They stand there in earnest conversation.This is especially true of the two oldest of the five drivers I see over and over again on this line. My Croatian is not good enough yet to follow everything in the conversations. But it’s like his riders think of the drivers and wise and trusted confidants. They also are very cool authority figures with students who ride. (And, unlike in America, this means kids from about seven years old upward riding the bus alone. It is no big deal. It’s how life is. Just like how it used to be in the United States.) If a kid gets on without saying a polite, “Dobar dan,” (Good day), it’s not unusual to see a bus driver chide him kindly about it. I also watched one day when a teen dude, in a very crowded bus, leaned over too close to the driver . . . who put a polite and firm hand on the dude’s shoulder while he kept one hand on the wheel, and pushed him. Not hard. Just right. Without a word. Just a, “Watch your space, son,” move. So. There you have it. How I get around here, and why I like it.